We all know that lots of android applications have already used navigation drawer. Most of the applications display navigation drawer on the left edge of the screen. Most of the time navigation drawer is hidden and is shown by swiping the screen or tapping the application or drawer icon. The Google design guidelines have a nice section on when and how to use the navigation drawer in an application. This time, I have collected some navigation drawer (sliding menu) user interface (UI) design for android project. You can find lots of third party navigation drawer libraries in the internet. With these libraries you can easily add navigation drawer in your application. 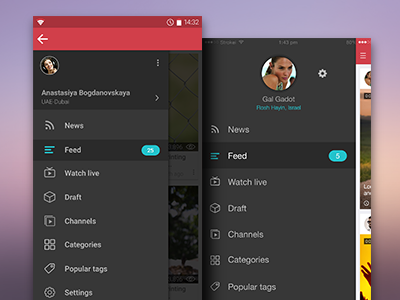 Android Navigation Drawer View: Material Design Support Library shows how to add navigation view in android app with material design support libraries.